Your driveway endures a lot of traffic, whether that means parked cars, running children, etc. Even though it’s one of the most used areas of your home, it’s not typically an area that we pay a lot of attention to unless there is an unsightly or urgent issue that needs to be resolved. However, that’s no reason to push driveway upkeep down to the bottom of your to-do list every week! 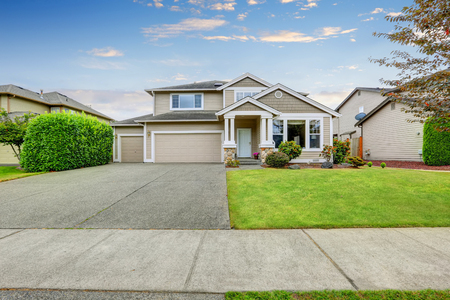 Here are a few easy maintenance tips that will keep your driveway, walkway, or patio in tip-top condition, improving your home’s curb appeal and helping you avoid repairs later! One of the main causes of driveway cracks is nearby tree roots that make their way to the surface and pushing through the concrete. Removing shrubs and trees near your driveway or any other concrete walkway can help you prevent cracks before they get the chance to form. Accounting for a runoff area for snow and rain can prevent water from sitting on your concrete and causing damage. Account for a two to three inch area around the driveway or walkway where the water travel and disperse. However, it’s essential that you make sure the water empties onto the yard or street, and not pooling at the end of the driveway. Concrete driveways unfortunately require regular cleaning and resealing to maintain their good condition. The regularity in which this occurs depends on what weather conditions are in your area, but typically it needs to be done every two years or so. A tell-tale sign that your driveway is ready for a touch-up is when it starts showing some wear and tear. Sealer is typically easy to apply on your own, just follow the recommendations and ask your contractor for help if you’re confused. Concrete is one of the most durable and reliable materials for driveways, patios, and more across your property. At Templin Concrete, we work with you to design and install a concrete driveway that fits your needs and curb appeal and are readily available to offer you our exceptional concrete repair services. Give us a call at 612-388-1945 to learn more!